The Houston Astros are the 2017 World Series Champions! The reigning World Series Champs look to continue to dominate this year after a more than impressive 2017 season. Their World Series title was the first in franchise history, beating the Los Angeles Dodgers 4-3 in the Championship series. The Astros playoff series began at home against the Boston Red Sox in the AL Division Series. The Astros swept the Sox, defeating them in the series 4-0, and continued on to face the New York Yankees. The AL Championship Series was a tight one, but the Astros came out victorious after defeating the Yankees 4-3. It was the Astros' second league championship in franchise history. Houston continued to fight for survival in the playoffs. Their hard work and determination never let up and the Astros achieved their first World Series trophy in franchise history. 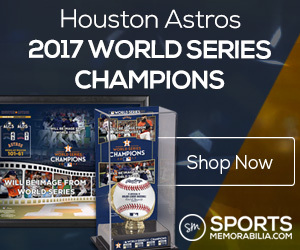 Get your 2018 Houston Astros tickets and see the reigning World Series Champs in action. From their inception in 1962 as the Colt .45s, to the 34 years in Astrodome, to the exciting games at Minute Maid Park, the Houston Astros have enjoyed quite a journey. The Houston Colt .45s was renamed Houston Astros in 1965 and the same year they inaugurated Astrodome, an indoor baseball stadium. With a 2-1 exhibition victory over the New York Yankees, the Astros announced their arrival. 2005 AL Pennant – It wasn’t the best of starts for the Houston Astros. At 15-30 they were written off by most experts, until they finally ended their losing streak with a 5-1 road win over the Chicago Cubs. This was just the push the Astros needed. Consecutive wins over their Wild Card nemesis Philadelphia Phillies and Milwaukee Brewers, helped them finish with a 74-43 record. The Wild Card went to the Houston Astros and it set the momentum for the 2005 National League Championship Series. It was Houston Astros vs. St. Louis Cardinals. The Minute Maid Park and Busch Stadium (II) hosted three games each, and the 'Stros opened the series with a loss. They bounced back by winning games 2, 3 and 4, suffered another blow by losing game 5 and finally sealed the deal with 11 homeruns in game 6. Astros pitcher Roy Oswalt did not just win the MVP Award that season. Team’s owner Drayton McLane promised Oswalt a bulldozer if they won the NL Pennant – they did and Oswalt received his shiny new yellow Caterpillar D6N XL tractor right before Christmas. 1997-1999 Central Champions – 1997 was the year of fine-tuning and it started with Larry Dierker. Former pitcher and a broadcaster, he was offered the job of Houston Astros manager. The baseball world treated it as a joke – laidback broadcaster dressed in Hawaiian shirts. But in the end the joke was on the National League Central Division. Houston Astros first NL Central Division victory came after 11 years, last when Mike Scott steered the side to a NL West Division title (1986). The Astros flourished under Dierker as he raised the level of pitching and kept the side from choking under pressure during the Pennant race. It allowed them to make a second appearance in the playoffs and by posting 102-win record, lifted their consecutive National League Central trophy in 1998. 1999 is memorable for more than one reason. Of course it brought the Astros their third consecutive National League Central title, but it was also their last year at the infamous Astrodome. The 1999 Championship represented a sound victory over tremendous adversity that the Astros faced during that season – injuries and Larry Dierker recovering from a near-death seizure. The Astros have their share of rivalries but compared to the fierce ones like New York Yankees and the Boston Red Sox, theirs lack intensity. Astros-Rangers Rivalry – The Houston Astros and the Texas Rangers share rivalry based on their geography as both are based in Texas. It started after Astros’s Nolan Ryan left the side to join the Rangers and it didn’t sit well with the fans as well as his team mates. In their head to head meetings, Rangers lead with a 61-101 win-loss record. Astros-Cardinals Rivalry – Fans call it a fun rivalry, driven by talent on both sides. Their games are competitive, tough but lack the fierceness seen in other rivalries. Fans of the two teams have a love-hate relationship. Craig Biggio, Jeff Bagwell, Derek Bell and Sean Berry formed the Houston Astros Killer B’s, name given to them on the basis of their surnames. Considered some of the best players to have represented the franchise, they played a huge role in the Astros winning Central Division titles as well as the AL Pennant. Roy Oswalt, Nolan Ryan and Roger Clemens are the best pitchers to put on an Astros uniform. Oswalt especially helped the side reach the World Series in 2005 and is considered a legend in MLB. The Houston Astros moved to the Minute Maid Park in 2000. Located in downtown Houston, can seat over 40,000+ fans. Best known for its sloping center field, Minute Maid Park also hosted the 75th MLB All Star Game in 2012. The Stadium is equipped with complete stadium Wi-Fi and is the first major sports facility to use a separate video board exclusively for closed captioning for the hearing impaired of PA system and video board content. Entering the 2017 campaign with a better offense and a strong bullpen, the Astros appear poised to improve on their last year’s record. Astros Game tickets for the season are in demand, especially since the tide has turned in their favor. Our process for purchasing cheap Houston Astros tickets is simple and fast. There are so many online ticketing sites, that it can be hard for customers to find the right place to buy Houston Astros tickets at the cheapest price. At ScoreBig we think of our customers first and foremost. We offer daily deals for Houston Astros events, so our customers can get the best seats for the best prices. ScoreBig will always go above and beyond to offer the cheapest Houston Astros tickets on the market. The Houston Astros schedule above, displays all available events for 2019 and 2020. Once you find the event that you would like to go to, click the red “Get Tickets” button. It is located on the right-hand side of the event listing, it will take you to an Houston Astros event ticket page. ScoreBig's event ticket page will display all available Houston Astros tickets for that event. On the event ticket page to help with your search for the right Houston Astros tickets, use the filters at the top to select quantity, price range, and more. There is also an interactive seating chart so you can pick where you want to sit. When you are ready to buy a ticket, click on the listing, and you will be directed to ScoreBig's checkout page. Upon completion of the information fields, your order will be processed and your Houston Astros tickets will be delivered via email, mail, or to your mobile device. What makes ScoreBig’s site stand out from the rest? We are constantly analyzing our competitors to improve our site, service, and prices. ScoreBig.com employees strive to offer the best process and experience to buy cheap Houston Astros tickets. Our goal is to get you the best seats to Houston Astros events. We offer daily discounts on our site and for special promotions check out our newsletter. If there are no Houston Astros events currently available, you can use our search feature at the top of the page to see a list of all popular events going on near you. No matter your price point, we have all the best deals and discounts on Houston Astros tickets. For more information on prices of Houston Astros tickets and the schedule for Houston Astros, check out our listings above. The last thing you want to find out is when the Houston Astros event you wanted to go to is sold-out. Don’t worry in many cases ScoreBig has affordable tickets to sold out events. We sell tickets from GA all the way to premium seating and parking. Skip the scalpers in the parking lot and get your tickets online from top Houston Astros ticket brokers. We get you in all events, buy your Houston Astros tickets here from a brand that many trust and rely on for all their ticketing needs. ScoreBig offers a 100% money-back guarantee. If you have been in search of cheap tickets for Houston Astros, ScoreBig by far is the best option. That’s why ScoreBig has more loyal customers than any other ticketing site. Shop at ScoreBig for safe and secure Houston Astros event tickets.